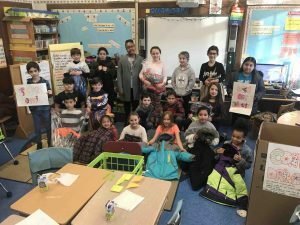 Photo caption: Members of the Southampton Elementary School Student Council are working on a community service project to help those in need this winter. During the past month, they have been collecting gently used coats that will be dry-cleaned by Good Ground Cleaners in Hampton Bays and then delivered to the Heart of the Hamptons groups. The project is one of many that the student council has worked on this school year. Earlier this year, they held a water bottle collection to raise money for the Women’s Cancer Coalition and collected shoes for Operation International, which provides medical and humanitarian aid to impoverished countries.